We’re always on the lookout for exciting new products here at Able, and recently we found one that has our employees and customers alike buzzing with anticipation. We love to find products that provide excellent utility, products that fill a niche perfectly, and that’s what we have with Bosch’s new Inverter Ducted Split Air Source Heat Pump. We all know that when it comes to comfort, nothing can match the consistency of an inverter compressor. Inverter-driven heat pumps are an ideal comfort solution in nearly any application and Bosch’s IDS system is no exception; it employs a top-of-the-line fully-modulating inverter designed by Mitsubishi. Typically, when your thermostat makes a call for heating, it activates your furnace which then runs until your home is slightly above the desired temperature. After that, the furnace deactivates until the temperature has fallen below your desired temperature. This results in a system that keeps your home near the desired temperature rather than at it. 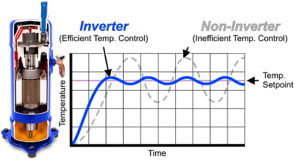 With an inverter-driven heat pump, you completely eliminate this short-cycling on/off cycle. The inverter can make precise adjustments to ensure that your home is being kept at the exact temperature you want. Furthermore, in addition to providing more dependable comfort, invert-driven systems also reach their target temperatures more quickly. A vast improvement to the comfort provided is not the only benefit of an inverter-driven system, they also consume significantly less energy. This means lower energy costs, and since heat pumps are used in all seasons, those savings are year-round. These heat pumps are so efficient that they even qualify for up to $600 in rebates from ComEd! Since Bosch’s inverter heat pump is compatible with any coil that has a TXV valve, adding it to your home is easier than most retrofits. The inverter heat pump is the perfect replacement for traditional air conditioners. Not only does it provide high-efficiency cooling, it also handles most heating applications better than a furnace. Bosch’s IDS system also supports dual-fuel applications. This means that you can pair it with your existing furnace for the best of both worlds. The high-efficiency heat pump will handle the lion’s share of the work, keeping your home consistently comfortable even as conditions outside change. When it gets really cold, your furnace will kick in to provide additional warmth as needed. If that’s not enough to love, there are plenty more reasons to get behind Bosch’s BOVA heat pumps. For starters, it’s quieter than the competition at only 56 dB. We’ve had several contractors install and start-up these units only to wonder if everything was running properly on account of the low operational noise level. Summer is the perfect season to pitch these products. If you have any customers who are looking to replace or upgrade their outdoor condensers, add Bosh’s inverter-driven split heat pump to the quote sheet and explain just how much better they’ll feel and how much more they’ll save!